There’s no easier or more cost effective way to update your kitchen’s style than by giving the cabinets a fresh coat of paint. 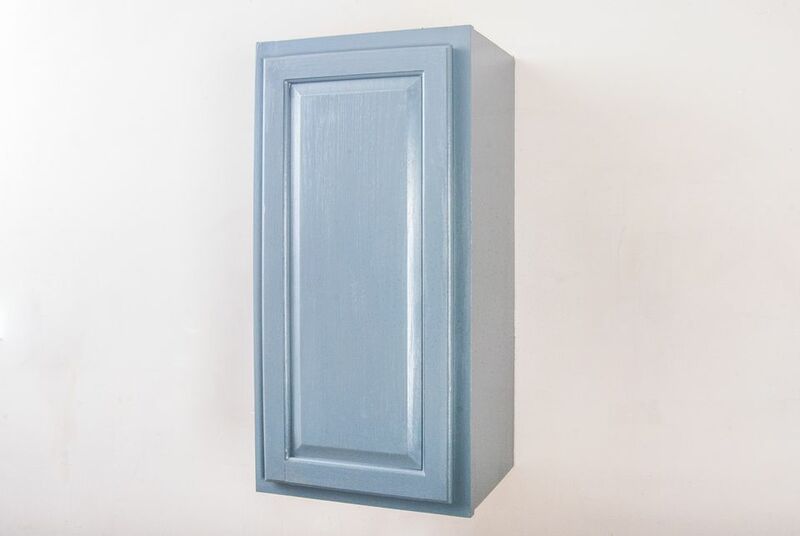 Here we’ll renew a tired old oak kitchen cabinet by painting it in a contemporary soft gray. After the paint dries, you can also install new knobs to go with the new color. Before painting your cabinets, you first need to decide whether to use oil-based or water-based latex paint and primer. If your cabinets were previously painted with water-based latex paint—often labeled latex enamel—stick with that; you can use latex over oil but oil won’t adhere well over latex. Of course, that also makes latex a safe bet if you don’t know which type the old paint is. Either type of paint will work over a clear finish. Beyond that there are pros and cons to consider: Latex paints have improved, but many professional painters believe that oil-based paints still produce a smoother and more durable surface. Durability is important for kitchen cabinets that get lots of use. On the downside, oil-based paints produce fumes you may not want inside your home and you need to clean your painting tools with mineral spirits. Today’s latex paints are virtually odorless and clean up is done with soap and water, which is a lot easier. Once you’ve chosen oil or latex, you need to choose a degree of gloss. For cabinets, it’s best to go with semi-gloss, or if you want them really shiny, gloss. The cabinets will be easier to clean than if you paint them with flat or eggshell. Get a good-quality 2-inch-wide tapered brush. For oil-based paint, be sure to use a natural bristle brush, or a synthetic bristle brush specifically designed for use with oil. Latex paints require a brush with synthetic bristles—water in the paint expands natural bristles and you won’t get a good result. If your cabinet doors are flat without raised panels, you can speed the work by using a fine-nap roller. It really pays to invest in a paint pail—painting out of the can is inconvenient and the paint drips create a mess—paint will splatter when you hammer the lid on between painting sessions. Look for a painter’s bucket with a side handle, an inside lip for wiping paint off the brush and a small magnet on the inside that will hold the brush upright when you are not using it. Unscrew all hinges from both the doors and cabinets and unscrew any pulls or knobs from the doors and drawers. Most cabinets today come with cup hinges, sometimes called European hinges. For each hinge, remove the single screw attaching it to the cabinet frame and the two screws attaching it to the door. If you have drawer faces that are screwed in place through the inside of the drawer boxes, remove the faces. Put each type of hardware in its own zip lock bag or other container along with its screws so nothing gets lost. Protect the floors with drop cloths and cover the counters with rosin paper, using masking tape to hold the paper in place. Kitchen cabinets get greasy, so paint may not adhere well unless you clean them thoroughly with a grease cutter, such as trisodium phosphate (TSP), which is sold in hardware stores, home centers, and paint stores. Some states have banned phosphate. In those states, you’ll find a product called TSP-PF (phosphate-free) sold instead. Mix the cleaner with warm water as directed on the package, wipe all surfaces with a sponge, and then rinse with warm clean water. The purpose of this sanding is to scuff up and dull the surfaces so that the primer will adhere well. Use #120 grit sandpaper with a sanding block for the flat areas. Use a small piece of sandpaper for rounded or contoured surfaces. Put newspaper or a drop cloth on your work surface and put the doors and door faces on scraps of wood to raise them slightly. This allows you to paint edges without worrying about them sticking to the cloth or paper when the paint dries. Whether you are priming or painting, the procedure is the same. The only difference is that you want to work the primer into the wood a bit, while when painting you want to focus more on long even brush strokes. If you are priming or painting flat doors, just start from one side and paint with long overlapping strokes from top to bottom. When priming or painting raised panel doors or anything else laid flat, it’s best to paint the highest parts first, so you can brush out any drips into lower spots. For the front of raised panels, this means you’ll start with the frame, then paint the center field, and finally the narrow contoured area between the center field and frame. Use painter’s tape to mask off any adjoining surfaces and areas inside the cabinet that you don’t want to paint. Then “cut in” where the cabinet meets a wall, ceiling, or floor. This is where your tapered brush really comes in handy. Apply a coat of paint to all the primed surfaces, finishing up with top-to-bottom strokes along the grain. When the paint dries, usually in about four hours, apply a second coat. Now you are ready to reinstall doors and drawers and enjoy your renewed kitchen.